Russian warplanes, according to local sources from Deir al-Zour, launched six air strikes with cluster bombs on river ferries that were carrying dozens of civilians fleeing the countryside of Deir al-Zour to other areas, resulting in more than fifty deaths and dozens wounded, mostly children and women. The chances of survival are almost nil, even for the civilians who have been forced to flee by heavy air strikes that left many of them dead in an undetermined tally that is expected to increase due to the lack of statistics on missing persons still under the rubble. 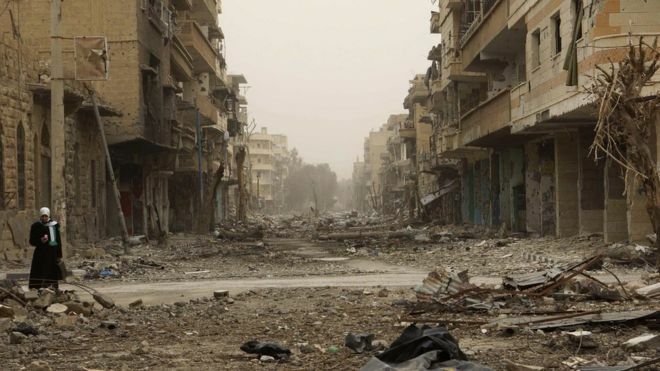 According to activists in the city, more than 1,000 air strikes and the dropping of large numbers of barrel bombs, cluster and phosphorus bombs as well as ballistic missiles, have been registered over the past few days. Since March 2011, Syria has been in the midst of an unjust war and fierce battles forcing more than half the population to leave their homes; with an estimated 5 million fleeing the country and more than six million internally displaced. The Syrian crisis, which has been described as the worst humanitarian catastrophe of the present era, has caused untold suffering for women, children and men in all regions, particularly those that rebelled against the oppression of the brutal Baathist regime that used its military machinery and its political and military alliances to abort the revolution but to derail it from its path, to settle the issue by the international alliance gathered to fight Islam on the land of Ash-Sham. For years, America worked to subjugate the people of Ash-Sham by all means and methods, including truces and cease-fire agreements that began on 30th December 2016 following the agreement of the parties gathered at that time in Ankara, which was not imposed on the regime and its alliances. Following up the military events on the ground, massacres continue to be perpetrated and indiscriminate shelling remains the master of the situation in areas not covered by the resolution under the pretext of combating terrorism. And here is the opposition abroad, still meeting from Geneva 1 to Geneva 8 and then Astana 1 to Astana 6, where all statements indicate the start of the implementation of America’s plan and their latest solution imposed by the steadfastness of the people of Ash-Sham, namely, the military occupation of Syria by studying the possibility of sending peacekeeping forces to the de-escalation zones, especially to the province of Idlib. And to implement its colonial objectives, it intensified its fierce military offensive on the regions, targeting civilians and infrastructure and committing massacres after massacres, where upon the International Committee of the Red Cross pointed out a few days ago, that violence in Syria has been the worst since the fall of Aleppo. And here are the rulers of Muslims who flock to the enemies of Islam. The Kingdom of Saud clan holds economic deals and sets future visions for its full cooperation with the murderer of the children of Syria during a warm welcome visit to the murderer’s home! And here is the ruler of Pakistan, conducting joint military exercises with Russia while it fires rockets from its submarines and aircraft to demolish homes on its occupants!! And there are other shameful positions that are of unspeakable foulness, while the world sees the shreds of our children and hears the screams of our mothers. Even denunciation and condemnation has become from the past and does not correspond to the amount of their agency to the Kafir West. No longer is it any clearer than this employment and those statements that revealed the colonial purpose of America and its allies, which, despite all their criminality against Muslims, they failed, rather they awakened Muslims more on their Islam and made them realize that those who extend the hand to America and its allies are the stumbling block in the face of the return of Islam to governance, specifically, in the face of the return of the second righteous Caliphate.